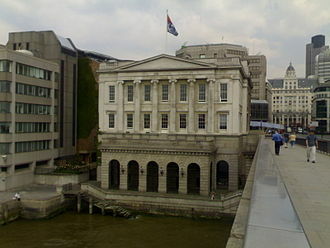 The Worshipful Company of Water Conservators is one of the Livery Companies of the City of London. In 1988, some members of the Select Society of Sanitary Sludge Shovelers (5S), who were also members of the Institution of Water and Environmental Management (then IWEM, chartered in 1995 so now CIWEM), decided to found the Guild of Water Conservators. It was recognised as a company in 1994. Its petition for livery was granted by the Court of Aldermen with effect from 2000. The Water Conservators' Company ranks 102nd in the order of precedence of the City Livery Companies. The supporters of the Company's coat of arms consist of a beaver and an otter. Each of them is holding a golden shovel to recognise the part played by the British chapter of the 5S (whose badge is a golden shovel) in the formation of the guild. The Worshipful Company of Cutlers is one of the ancient Livery Companies of the City of London. It ranks 18th in the order of precedence of the Companies, the trade of knife-making and repairing was formed in the thirteenth century as a guild, the Cutlers Company received a Royal Charter in 1416. Thus, the Livery Company remains primarily as a charitable institution, the Company funds and administers a variety of educational initiatives such as scholarships and awards. The Cutlers Company Arms have been in use since 1476 and its current Elephant and Castle crest was granted in 1622, this features two elephants and three crossed-swords, a helmet and a smaller elephant and castle. The original heraldic blazon read, Gules, three pairs of swords in saltire argent and pommels, or, Crest, An elephants head couped gules, armed or. The elephant probably relates to the used in hafting swords, knives. The elephant and castle crest gave rise to a pub of the name on the site of an old cutlers inn at Newington, south London which in turn gave its name to the well-known area Elephant. The Worshipful Company of Armourers and Brasiers is one of the Livery Companies of the City of London. The Armourers Guild was established in 1322, it received a Royal Charter in 1453, other Companies, including the Armour Repairers, merged with the Armourers. In 1708, brass workers joined the Company, which was renamed as the Armourers and Brasiers Company, the Company does support the metallurgy industry, but does not retain a close association with its original trade, as is the case with a majority of Livery Companies. It exists primarily as a charitable establishment, the Company is based at Armourers Hall, situated on the corner of Coleman Street and London Wall, and has occupied this same site since 1346. The Hall was one of the few to escape destruction in the Great Fire of London in 1666. In 1795, the Hall was enlarged, but it was decided in 1839 to rebuild it completely, the lantern, or dome, of the Livery Hall was added in 1872. On 29 December 1940, during a blitz on London, the surrounding area was devastated. The Worshipful Company of Curriers is one of the ancient livery companies of London, associated with the leather trade. The Curriers Company, like other companies, supports the work of the Lord Mayor, the City Corporation. The company ranks 29th in the order of precedence of City livery companies and its motto is Spes Nostra Deus, Latin for Our Hope is in God. Most of the Curriers Company archives are kept at the Guildhall Library for public view, the Curriers Company dates from 1272 when the Art or Mystery of Curriers formed a trade association with the tanners. In the 14th century the Curriers constituted themselves into a guild linked with the fraternity of Carmelite Friars near Fleet Street. In 1415 the City Common Council granted them full autonomy over all currying and tanning trade in and within two miles of the City, during the ensuing four centuries the company built no less than six Curriers halls in London. After the sale of its sixth and last hall in 1921 it moved in with its trade and livery partner. Along with many other livery halls, Cordwainers Hall in Cannon Street was itself destroyed by action in 1941. However, from 1942 onwards the company has been housed at Tallow Chandlers Hall, historically several streets in the now London Borough of Camdens environs were named after the currying trade, eg. The Curriers Company donates to charities which benefit the young, the elderly, the disabled and it primarily supports City of London charities and cultural organisations, general educational establishments and the training of young people in leathercraft. In 2000 the Curriers Millennium Healthcare Bursary was established and this annual bursary endows research or personal study to improve the health care of underprivileged sectors of Londons population or elsewhere. 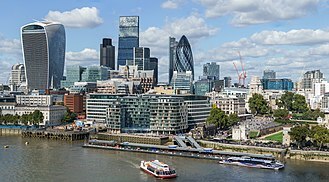 The Curriers Company is affiliated to military units in HM Armed Forces,101 Engineer Regiment, No.7 Squadron RAF, the Curriers Historical Essay Prize on the history of London is competed for by young graduates of British universities annually. It has created 16 annual prizes in mathematics and history for pupils aged 14 to 15 at the four London academies of the Oasis Trust, each newly-elected Master Currier has the option of designating a charity of choice, Master’s Charitable Appeal. The Master and Company make initial donations, freemen, the company encourages any enterprise which supports its charitable giving. The present Clerk to the Curriers Company is Adrian Rafferty, whose role combines that of executive officer as well as supporting the Master and its honorary chaplain is the Revd Ann McNeil. 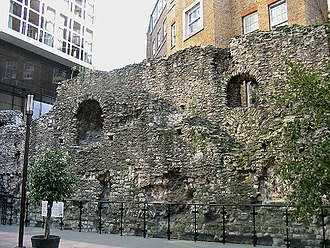 Circa 1583 the Curriers’ Hall was situated close to the site of the Boar’s Head and it stood in the parish of St Alphage, on the south side of the street leading along London Wall, Boar’s Head Alley lay between Philip Lane and Little Wood Street. Curriers’ Hall was one of the 44 livery halls destroyed in the Great Fire of London early in September 1666, Curriers’ Hall in 1670 was perhaps the most attractive of the company’s five halls on the Boar’s Head site. 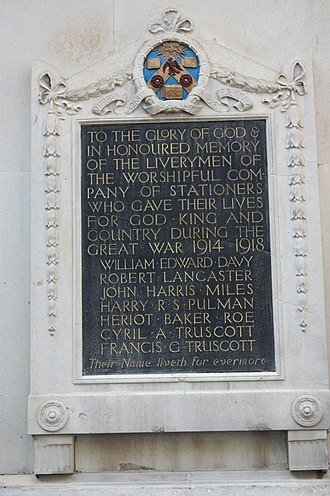 The Worshipful Company of Painter-Stainers is one of the Livery Companies of the City of London. An organisation of painters of metals and wood, is known to have existed as early as 1283, a similar organisation of stainers, who generally worked on staining cloth for decorative wall hangings, existed as early as 1400. The two bodies merged in 1502, the new organisation was incorporated under a Royal Charter in 1581, each student receives £5,000 annually from the beginning of their second year until they complete their studies, and they are known as a Painters’ Company Scholar. The students are selected entirely on merit and this is the most meritocratically-awarded scholarship for art students in London today, with prize money of £30,000 the Prize is one of the most prestigious awards to artists in the UK. Eleven Liverymen have served the office of Lord Mayor since 1922, the Company ranks twenty-eighth in the order of precedence of Livery Companies. The Companys motto is Amor Queat Obedientiam, Latin for Love Can Compel Obedience, the Master for the year ensuing 19 October 2015 is Anthony John Ward, son of the late Liveryman and scribe to the Company, John Ward. The Worshipful Company of Mercers is the premier Livery Company of the City of London and ranks first in the order of precedence of the Companies. It is the first of the Great Twelve City Livery Companies, although of even older origin, the Company was incorporated under a Royal Charter in 1394, the Companys earliest extant Charter. The Companys aim was to act as an association for general merchants. By the 16th century many members of the Company had lost any connection with the original trade, the Company exists primarily as a charitable institution, supporting a variety of causes. The Companys motto is Honor Deo, Latin for Honour to God, the word mercer derives from the Latin merx, merchandise from which root derives the word merchant. In recent times the Company has founded a City Technology College, there was a Mercers School which was granted its first charter in 1447, and closed in 1959 when pupil numbers fell. The school was most recently based in Barnards Inn in Holborn, in 2011, the Mercers co-sponsored a new academy school, Hammersmith Academy, specialising in creative and digital media and information technology, located in Hammersmith. The school was established in a new building, with support from the Mercers, the Mercers Company is based at Mercers Hall in Ironmonger Lane, off Poultry, in the City of London. From the 14th century onwards the Company held its meetings in the Hospital of St. Thomas of Acon on nearby Cheapside, between 1517 and 1524 the Company built the Mercers Chapel on this land, with the first Mercers Hall above it, fronting Cheapside. The building was destroyed in the Great Fire of London in 1666, the second Hall, designed by Edward Jarman and John Oliver, opened in May 1676. The Hall was extensively refurbished during the period 1877 to 1881, the frontage was remodelled by George Barnes Williams and the interiors were redesigned by John Gregory Crace, the renowned Victorian designer. The Hall was destroyed by fire in 1941 during the Blitz, the third and present Mercers Hall was opened in May 1958. The architect was E. Noel Clifton of Gunton and Gunton, the Hall incorporates fittings from the old Hall, including some 17th-century woodwork and Victorian stained glass. The Worshipful Company of Drapers is one of the 110 livery companies of the City of London. It has the formal name The Master and Wardens and Brethren, more usually known simply as the Drapers Company, it is one of the historic Great Twelve Livery Companies and was founded during the Middle Ages. An informal association of drapers had organized as early as 1180, the organisation was formally founded in 1361, it received a Royal Charter three years later. It was incorporated as a company under a Royal Charter in 1438 and was the first corporate body to be granted a coat of arms, the charter gave the company perpetual succession and a common seal. Over the centuries the original privileges granted by Royal Charter have been confirmed and amended by successive monarchs, the acting charter of today is that granted by James I in 1607, amended by four supplemental charters, most recently in 2008. The majority of drapers lived in and around Cornhill, Candlewick Street, possibly it was for this reason that their allegiance was transferred to St Mary le Bow in Cheapside and to St Michael, where the company continues to worship today. Despite these changes, the drapers retain the Blessed Virgin Mary as their patron saint, the organisation was a trade association of wool and cloth merchants. It has been one of the most powerful companies in London politics, over one hundred Lord Mayors have been members of the company, the first, Henry Fitz-Ailwyn, is thought to have been a draper. During the Plantation of Ulster, the company held land around Moneymore, the company operates as a charitable and educational institution. 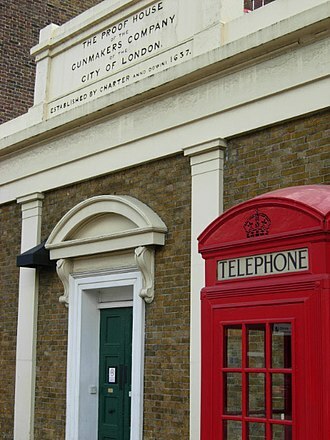 It administers three almshouses, Queen Elizabeth College Greenwich, Edmansons Close Tottenham and Walters Close Southwark and it provides the chairman and four other governors of Bancrofts School, who use the Drapers coat of arms and motto. It is the co-sponsor of Drapers Academy, which uses a similar logo, the Company founded two girls schools, in Llandaff and Denbigh, using the endowment of Welsh merchant Thomas Howell, who bequeathed a sum of money to the foundation. Both schools are independent and separate institutions but the Company still has a representative in the body of the former. Administration entrance to Drapers' Hall pictured in 2012. Crest of the Salters in a window presented in 1913 to the Guildhall in Londonderry. The Livery Hall of the Clothworkers' Company in 1859.